COLLINGWOOD premiership players Alan Toovey and Brent Macaffer will retire after the VFL finals. The popular clubmen both emerged from the rookie list to be key players in the Magpies' 2010 flag. 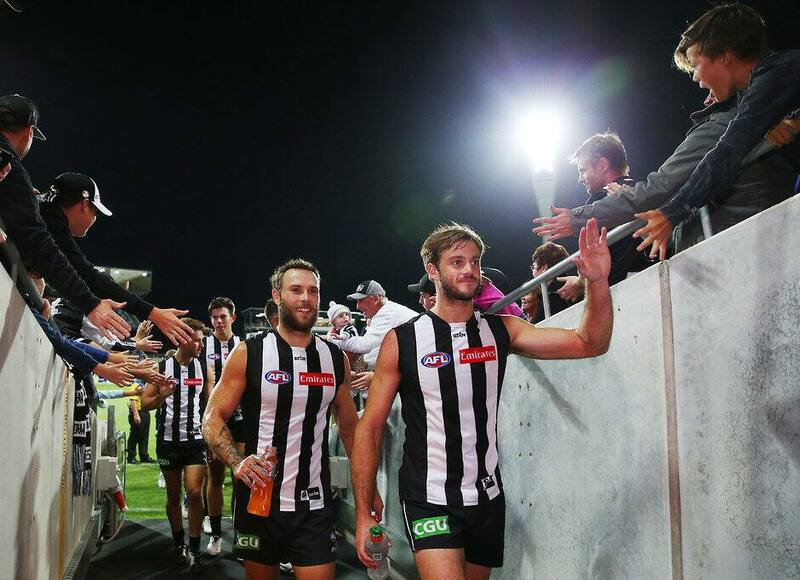 Magpies coach Nathan Buckley spoke highly of Toovey and Macaffer on Monday night, on the day the pair announced their retirements to teammates. "Today was a great opportunity to celebrate the careers of a couple of guys that have been fantastic clubmen," Buckley told Fox Footy. "It was fantastic to share (it) with players and staff alike, and it was literally a celebration of what they've contributed to the club, not necessarily 'goodbye'." Toovey, 29, was a reliable defender who became a trusted part of the back six, using his pace and courage to nullify some of the game's most dangerous forwards. He played 159 games after being added to the list from Western Australia in the 2006 rookie draft. After taking time to find his feet, he established himself in the senior line-up in 2009 and was a regular fixture until this season where he has played just eight senior games. Toovey was a popular figure with fans, who loved to call his name whenever he got the ball. He told teammates he fulfilled a dream when he played in a premiership. "The experience of coming over here from WA as a rookie first, just trying to get a spot and to then get that opportunity to play a game was a dream come true," Toovey said. "It was a childhood dream to win a 'granny' [Grand Final]." Macaffer, 28, was also a rookie list player who made his debut in 2009, performing well enough in the finals to gain his teammates' trust. He became a regular in 2010, playing 21 games and kicking 16 goals as a defensive forward. Unfortunately injuries ruined the following two seasons and after re-inventing himself as a run-with player he injured his ACL a second time at the end of 2014. He missed last season but fought his way back to play four games for the Magpies this year to bring his total games tally to 77. A member of the leadership group, he is a well-respected player at the club who began wearing number three in memory of his friend and former teammate John McCarthy who died in September 2012. Macaffer told teammates to cherish every moment, good and bad. "Once I got here I never thought I would play a game, so to punch out 77 games, might not seem like a lot in that time [but] to be here for 10 years I am just so grateful for every moment that I have been here," Macaffer said. Collingwood's VFL team is on top of the ladder heading into the final round and Macaffer said he is desperate for the Magpies to win that flag. "Even though it's VFL I want nothing more than to win a VFL flag," Macaffer said.